The Core would like to share an interesting source of literature-related art: The Federal Art Project, the visual arts arm of the WPA program from August 29, 1935 until June 30, 1943. The FAP commissioned unemployed artists, including Jackson Pollack, to create public service posters, murals and paintings. The paintings depict various programs and projects sponsored by the government: health and safety programs, cultural programs which include art exhibitions, theatrical, and musical performances, travel and tourism, educational programs, and community activities. The posters were printed mainly on poster board, but they were also produced as one-sheet and multi-sheet designs and were sometimes signed by the artist. Also done for the Illinois WPA Art Project. 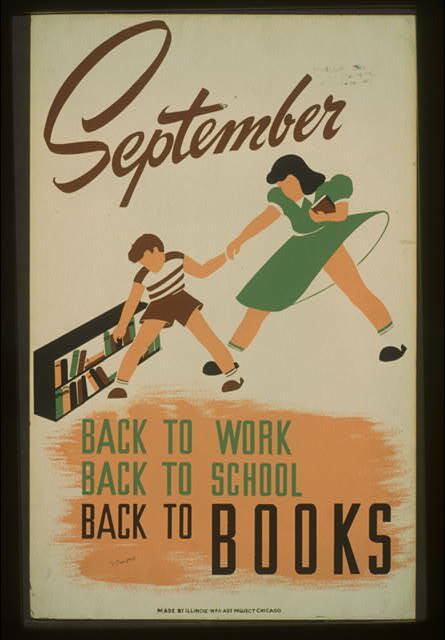 No artist is listed for this poster, which promotes reading and library use with children near bookshelves. For the full set of posters, visit bit.ly/ZLtGgl.